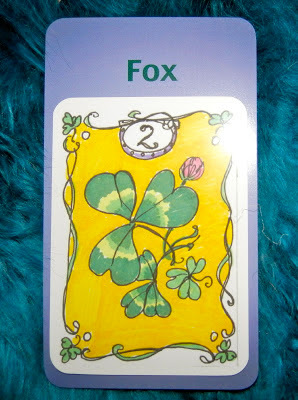 Weekend Reading SPECIAL EDITION*: Clover in the House of Fox from the Minute Lenormand and the Deck of Lenormand Houses. This is an interesting combination. Literally, you could translate it to be "luck in the house of lies". So either you'll get away with a lie this weekend or you'll be on the lucky end of a lie...maybe someone lying to save your arse! But Fox can also speak to employment matters, so if you're looking for a job right now or awaiting news about your job, things could turn out quite well for you. A third option is that you'll get lucky in the den (house of fox...haha). No matter how you look at this combo, it's going to work out in your favor. But in the case of the most literal sense of the twosome—luck in house of deception or lies—be sure to factor in the cost. You may get away with your deception or manipulation, but at what cost to your integrity? And what karma will you create? Sometimes it's better to just take the hit and deal with it now, rather than get away with deception and carry the burden around for a while. *This weekend reading will have to last you an extra day, because The Daily Draw will be closed on 3/11/13. For those who MUST have their fix, read this, this or this.